Looking for a fun game night idea for the entire family? 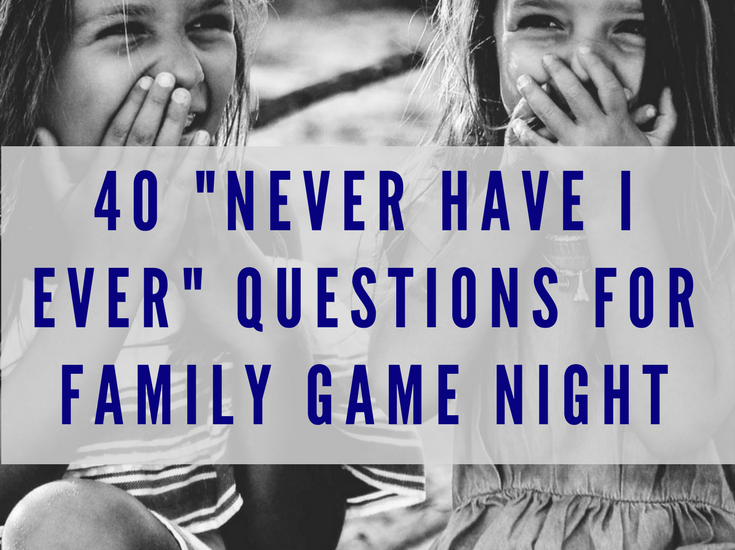 Try a few rounds of the classic game “Never Have I Ever.”You will learn so much about your family members, touch on some important subjects, and get a few good laughs in the process. Ready to get started? 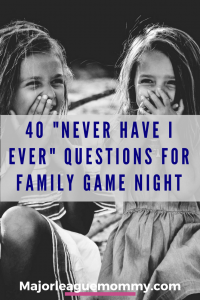 Here are 40 Never Have I Ever Questions for Family Game Night. This post may contain affiliate links. Disclosure can be viewed here. Never Have I Ever sat on the toilet and fell in. Never Have I Ever spoken to a random stranger because I thought they were my Mom. Never Have I Ever farted while exercising. Never Have I Ever peed my pants while laughing. Never Have I Ever been a bully. Never Have I Ever slipped and fell in public. Never Have I Ever eaten food off the floor. Never Have I Ever stolen something. Never Have I Ever wore my sibling’s clothes without permission . Never Have I Ever picked my nose with my finger. Never Have I Ever lied about being related to a famous person. Never Have I Ever wet the bed. Never Have I Ever cried at school. Never Have I Ever cheated on a test. Never Have I Ever been afraid of the dark. Never Have I Ever gone a week without a shower. Never Have I Ever pretended to like a gift from someone. Never Have I Ever taken a bite from someone’s food when they weren’t looking. Never Have I Ever “cleaned my room” by pushing everything into the closet or under my bed. Never Have I Ever pretended to be on the phone to avoid conversation. Never Have I Ever judged somebody based on how they looked. Never Have I Ever made up a lie to get off the phone. Never Have I Ever been on TV. Never Have I Ever pretended to be in a music video. Never Have I Ever really laughed out loud when typing LOL. Never Have I Ever cheated in a game. Never Have I Ever smiled and responded “Oh really?” to a little kid that I couldn’t understand. Never Have I Ever attended a sleepover. Never Have I Ever farted and blamed someone else. Never Have I Ever built a treehouse. Never Have I Ever created my own club with my friends. Never Have I Ever wanted to be a mermaid. Never Have I Ever quit something because I thought it was too hard. Never Have I Ever had a crush on someone in my class. Never Have I Ever broken a bone. Never Have I Ever received an award. Never Have I Ever faked being sick to get out of school or work. Never Have I Ever visited another country. Never Have I Ever had a crush on a cartoon character. Never Have I Ever broken something and hid it to avoid getting in trouble. Is there any way you can send this list of questions to me in an email? The content is protected. I would like to use them at my Sunday school fellowship on Friday but don’t want to type them all out…I would like to copy and paste your list of questions….if that’s ok!! 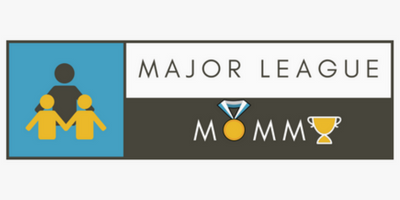 27 Easy Ways For Stay at Home Moms to Make Extra Money and Save Even More!